Every jIvathma is a property of emperumAn. His relationship with us is eternal. thirumangai AzhwAr states this as ‘empirAn endhai ennudaich sutRam enakkarasu ennudai vANAL’ . emperumAn has had his relationship with us from time immemorial. In navavidha sambandham, srI pillai lokAcharyar also states this. Most of our pUrvAcharyas’ avathArikai start in a similar trend. This is because they want us to understand the point that we are losing bhagavadh anubavam and they expect us to reform towards emperumAn. Seeing the situation, emperumAn is worried and wonders over the reason for not having anubhavam of Him and he finds a way to induce interest on us to have anubhavam of emperumAn. vyUhavAsudevan , kshIrabdhinathan in thiruppArkadal. antaryAmi rUpam is the emperumAn residing in all chith and achith. (periya perumAl vaazhi thirunAmam - ‘anthariyAmiththuvamum AyinAn vAzhiyE’. Finally, archAvatAram, the emperumAn we can see with our naked eyes (vigraharUpam). The above phrase means that unlike vibhavAvatarAs, which were useful only for people living in that time period for saranAgati (Achrayanam) , archAvatAram is the best form of emperumAn for Achrayanam for us .thirumangaiAzhwAr argues against all the other forms. In siriya thirumadal he questions us as, ‘ErAr muyal vittuk kAkkaip pin pOvadhE?’ . He says that rabbit's flesh is better than crow’s flesh and rabbit is easier to catch as it is terrestrial whereas crow can’t be easily caught. Here rabbit is archAvatAra emperumAn whereas crow is paravAsudevan. At another place he says ‘ulagam Eththum kaNdiyUr arangkam meyyam kachchi pEr mallai enRu maNdinAr uyyal allAl matRaiyArkku uyyalAmE?’ that is if there is no bhakti towards archAmUrti, then one can’t attain mOksham. More about archAvatAram can be read here. People who were not present during the time of vibhavAvatAras ( avathArangalukku pirpattAr) like us are denoted as pinnAnAr. Our goal of attaining paramapadham will be fulfilled only if we have bhakti towards archAmUrti. nammAzhwAr says, ‘avan ivan enRu kUzhEnmin nenjchinAl ninaippAn yavan avanAgum nILkadal vaNNanE’. avan is paramapadhanAthan . ivan is archAvigraha emperumAn. He advises us not to think inferior of archAmUrti in this pasuram as this archai emperumAn is the same kadalvannan. srI varavaramuni in thiruvAimozhi nUtrandhAdhi says ‘eidhumavarku innilathil archavathAram elidhenna’. Swamy says that archAvatAram helps us in attaining moksham. This archai emperumAn has made Achrayanam easy for us . Also, people of all countries can follow him and all people can do sharanAgati. kOyil is srI rangam. Like paramapadham, He has nithya sannidhi in all dEsams and all houses. This shows the sowseelyam of perumAl. Seelya is where a superior person has as his natural quality of moving freely with his inferiors. When this act is exercised for no selfish or other purpose, it is sowseelya. That is to say, emperumAn does not cause fear in the heart of the devotees by His paratva nor does He generate any feeling in them of undue hesitation to approach Him because of His superiority. 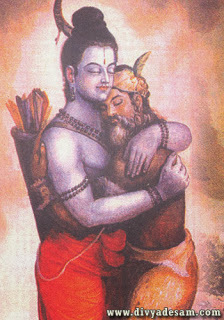 His sowseelya GuNam made Him serve as the Charioteer to Arjuna and as a messenger to pANDavAs at duryOdhanA’s court. When chakkravarthi thirumagan hugged a hunter, His sowseelya was exhibited. archai emperumAn is achritha parAdhInan as already seen by the srI sUkthis of kaliyan and vishadavAk shikAmani srI varavaramuni. emperumAn did not stop with archAvigraham because jIvAthmas thought that archai emperumAn was not fit for Achrayanam. So he sent AzhwArs like parAnkusan and pattanAdhan for upadEsam. emperumAn is protecting jIvAthmAs like us to survive. The verse ‘ rakshaka: sarva sidhdhanthE’ says this. emperumAn is the only rakshakan. This is one of the principles of srI vaishnavam. pArathanthryam, total dependence on perumAl for saving us, is a must for every srI vaishnavan.